The class lacking its own explicit logic, it is enough to declare the class and inherit it from Ext_Object. Where ExtJs component properties and config parameters in particular should be described. As the component inherits its properties from DateField and does not contain its own settings, just inherit the class from Ext_Property_Form_Field_Date. static public $extend - class name for the extend and Ext.create. 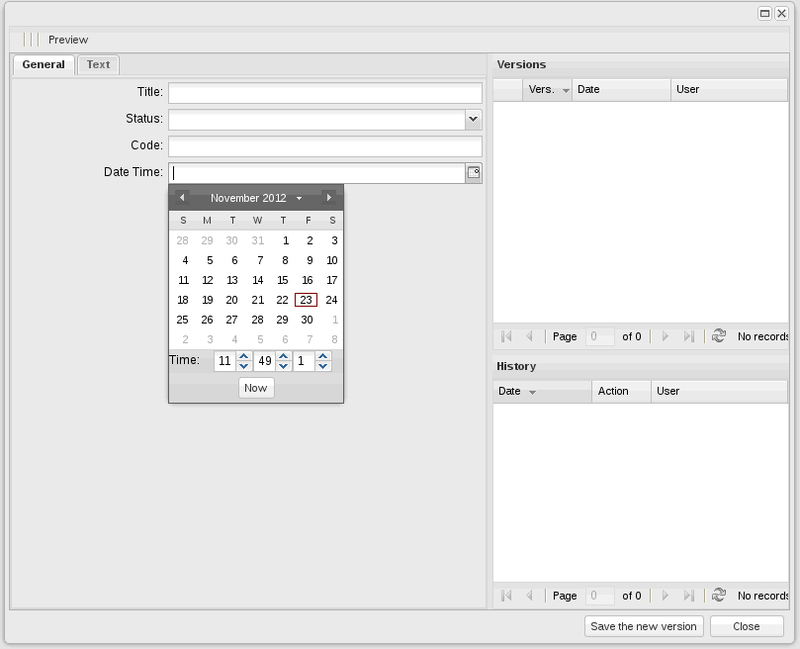 constructions, here - Ext.ux.form.DateTimeField. Backend_Controller_Crud, Backend_Designer_Sub_Viewframe, possibly in Backend_Controller as well. That’s it, the component has been integrated into the system. You can check it by loading the interface designer: select the form field and click 'Change field type' on the Properties panel. 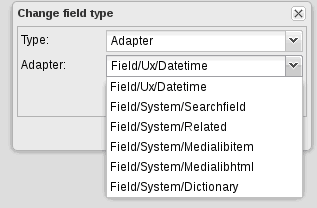 The field will show in the Adapter list. You might want to use this field when importing data from ORM and when automatically generating the interface instead of the ‘datefield’ one. It is quite easy to replace the field. Now, the interface is generated with this field.